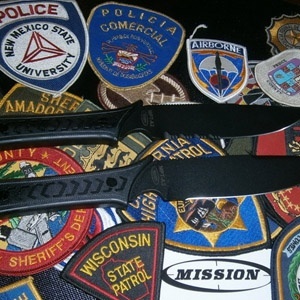 The MPT-A2 knife was designed as a combat and utility knife and has a thinner profile and handle for use with tactical gloves. This version of the MPT is made using A2 tool steel hardened to 58RC, providing exceptional toughness and avoiding the edge chip-out problems associated with steels fully hardened to 61RC+. The blade of the MPT is powder coated black for low reflectivity on stealth missions and has a distinctive false edge, which can be readily sharpened as necessary. The MPT design includes a choil which allows the user to safely place a forefinger in front of the lower guard for a better grip when using the knife for fine or delicate cutting. The grooved section on the MPT's spine gives a better non-slip surface when applying pressure to the blade with the thumb. A custom low profile Hytrel sheath is included to be worn on a hip or thigh. The MPT-A2 is available in approximate 12" length, .187" thickness, partially serrated or plain with black aluminum or G10 composite material handles with titanium hardware.